National Cherry Blossom Festival - Super Inky! One of my favorite cities to visit is Washington, DC- our nation's capitol. Recently, my moms took me there so that we could visit the National Cherry Blossom Festival. My parents' friend also came with her daughter, Megumi (who just so happens to be my neighbor, Zoya Yumiko's, cousin! small world!). We woke up early on a Saturday morning, piled into my mom's car, and drove all the way from New York City to DC. 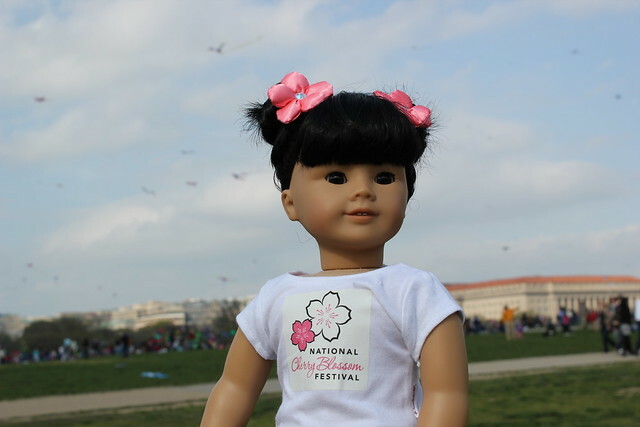 When we got there, we headed straight to the National Mall for the Kite Festival! Can you see the kites in the photo behind me? There were so many different kinds of kites! 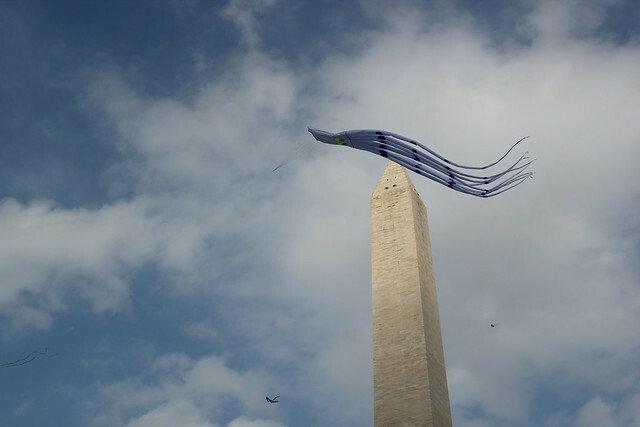 My favorite was a giant squid kite. You can see it in this picture I took of it flying next to the Washington Monument. Cool, right? 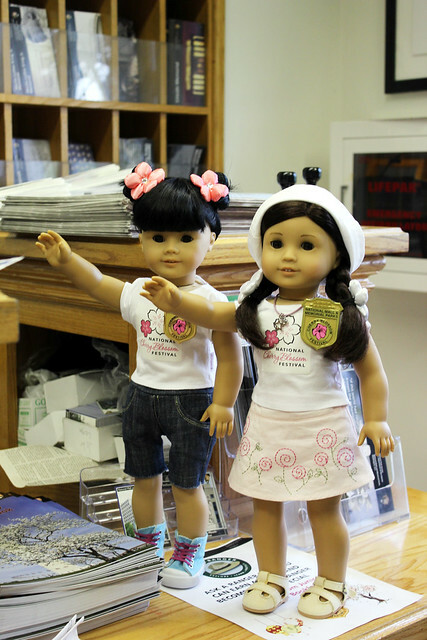 The Cherry Blossom Festival has its own special Junior Ranger program! 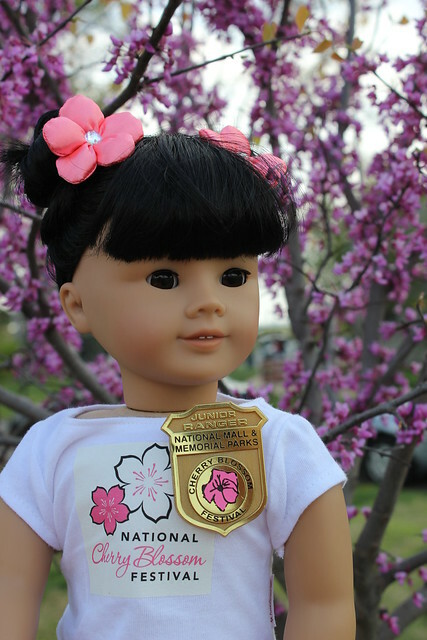 I'd already earned the regular National Mall Junior Ranger badge back in January when I visited with Piper, but Megumi and I still wanted to earn the special cherry blossom badge. We each worked on the activities in our workbook and when we finished, we were sworn in as Junior Rangers! I think it was Megumi's first time doing a Junior Ranger program. She just moved to New York from Japan. I should have asked her if they have junior rangers in Japan, but I didn't. After we were sworn in, we walked around the mall. Unfortunately, most of the cherry blossoms were gone at that point, so we needed to hike around until we finally found some trees that still had pink blossoms on them. When we finally found a little group of trees, Megumi and I plopped down in the grass and looked up at the sky and the kites above. Our parents got us souvenir tees to wear- aren't they cool? I really wanted the souvenir pink kite, but my moms said I probably wouldn't have anywhere to fly it in NYC. Megumi and I decided to take pictures of each other in front of our sad, lonely little cherry tree. Here's Megumi! She and her mom told us all about the cherry blossom festivals she's gone to in Japan. She taught us the word "hanami," which means cherry blossom viewing. Washington DC's Cherry Blossom Festival is a celebration of the gift of cherry trees from Japan to the United States a hundred years ago, in 1912. Some of the original cherry trees are still alive today! It was a great trip. I'm really glad Megumi could come along. Of course, I was really happy to earn another Junior Ranger badge! I've been thinking about becoming a park ranger when I grow up. There are so many awesome parks though; I don't know if I could choose just one! Inky, I always love your photos of Cherry Blossom Festival. I especially love your new Junior Ranger badge and matching hair do-dads. Thanks! The cherry blossom hair ties are from Build a Bear. That looks so fun, Inky! Glad you had a good time! I'm not actually sure how many Junior Ranger badges I have! I try to earn at least four every year. I would love to work at different parks. It would be so cool! Oooh! Another Badge for me to get, too! Thanks for the heads up and you take gorgeous pictures! Zabcia, do you like to do Junior Ranger programs too? Which badges do you have? Thank you for the compliment on the photos too! Inky, that looks like a lot of fun, and I'm glad you had a friend to share it with. Your shirts are really cool... and I love the blossoms you girls have in your hair, too! I think you'd make an awesome park ranger. A lot of people don't have the same job or live in the same city for their entire career, so maybe you could start at one park and then work at several more later on. You have lots of years before you retire, after all. The Cherry Blossom Festival looks great! I hope I get to visit it someday too. Thank you for the compliments! I love the new tees too. I would love to be a ranger at any park; they're all special- but there are some I know I'd want more than others- definitely Chaco Canyon! Do you have cherry trees in your city? I love the T-Shirts! The shirts look adorable! My aunt went to the festive too. But it was last year. Tell Megumi I said "Hi!". omg my school was performing in that festival!!! 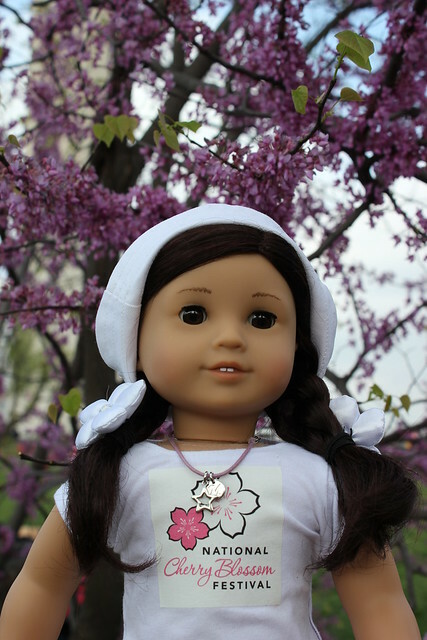 Where do you get your unique clothing and accessories for your dolls? I love the mac book and other items! Please share! :) Thanks! I get my clothing and accessories from many different places. I got the MacBook from a store here in NYC called Toy Tokyo. Please let me know if you would like to know the source of any other item. I'm happy to help! How do you get so many shirts with companies on them. Can you do a contest of a picture of oyur website logo please.